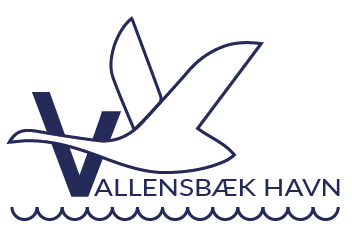 We warmly welcome you and your crew to Vallensbæk Harbour and wish you a pleasant stay. Less than a hundred meters from the harbour you find a wide, child-friendly sandy beach, and Vallensbæk Station is only 15 minutes’ walk away. From the station the S-train departs every 10 minutes for Copenhagen, with only 30 min. ride into Copenhagen Central Station. Below you will find some useful information about the harbour and its facilities, nearby shopping facilities, restaurants and cafés as well as links to places of interest, both in the vicinity and in Copenhagen. If you have any questions, you are always welcome to contact the port office. See opening hours at the bottom of the page. The harbour fee is due immediately upon arrival. Please pay at the harbour office, where you can also buy tokens for the laundry machine (DKK 20 kr.). Showers and toilet facilities are accessible with the electronic key you receive upon paying the harbour fee. Payment can be made by credit card or in cash in Danish kroner and euros. Opening hours and phone numbers are to be found at the bottom of this page. NB: The country code for Denmark is + 45. 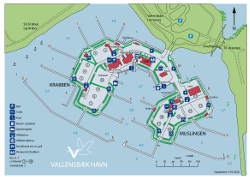 The map offers an overview of the harbour facilities, including toilets and showers. Click to view larger size. The harbour can be approached by day and night, but be aware of the rows of fishing stakes stretching up to a distance of 4 nautical miles from the coast. Use the passage between the fishing zones to the east and west of the harbour. The lighthouse on the southern jetty flashes red in a sector from 060 ° to 338 °. The water depth in the harbour entrance is 3 meters and in the center port 4 meters. For other locations, please consult the harbour map. Electricity and water are available at all piers. There are toilet and bath facilities on both harbour islands. The laundry is located at the back of the toilets and showers at Muslingen (tokens for the laundry machine can be purchased at the Harbour Office). Guests are welcome in Vallensbæk Sejlklub’s clubroom on the 1st floor of the clubhouse (above the Restaurant Krabben) when not otherwise occupied. You’re welcome to bring your own food and drinks. Bikes can be borrowed free of charge at the harbour office (a deposit of DKK 50 is required). A number of barbecue areas with covered tables and benches are located in the harbour, and as guest you are very welcome to make use of them. For the youngest there is a playground next to the café/ice cream shop at the harbor square. The harbour offers service lifts of up to 20 tonnes. Contact the harbour office for price and booking. The nearest shop with boat equipment is Tempo Både, Søhesten 8 in Ishøj, a bike ride of 8 minutes or approx. 30 minutes walking. In case of an emergency, call an ambulance by dialing 112. A defibrillator is placed next to the entrance door to the harbour office. Restaurant Krabben is open daily 12 – 10 pm for lunch and dinners. See menu, etc. here. Sisters P Ice-cream parlour and Café at the harbor square is open from kl. 11 am to 9 pm in the summer months. 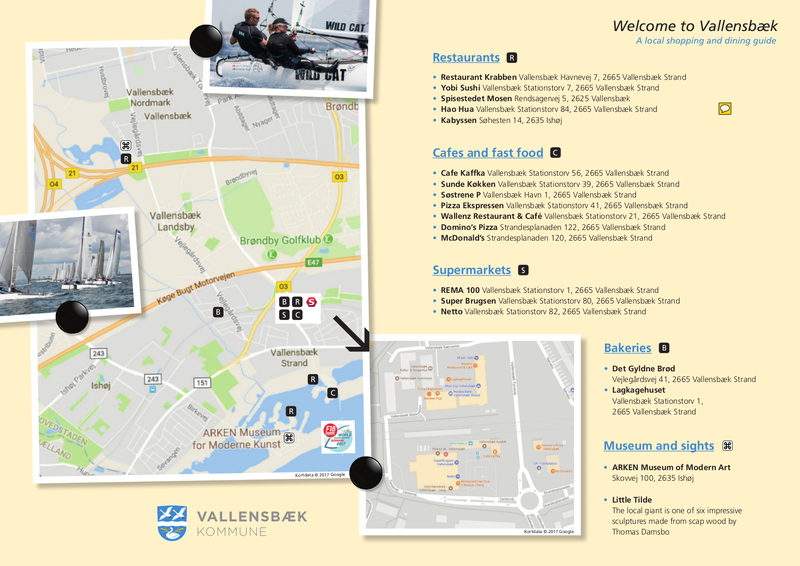 At Vallensbæk station, a short walking distance of the harbor, you will find several supermarkets, a banks, a pharmacy, kiosks and bakeries as well as several dining options from McDonald’s and Dominos to pizzerias, sushi and Asian restaurants. See the map. Less than a hundred meters from the harbour lies Strandparken’s wide, child-friendly sandy beach with dunes and jetties – one of the country’s best beaches. Strandparken is a manmade nature area, which offers good walking and cycling opportunities and great fishing. The coastal area of Køge Bugt, where Vallensbæk is located, offers many attractions and activities. Read about them here at VisitVestegnen. Among the most famous is the ARKEN, the Museum of Modern Art, located in Strandparken on the Ishøj side. You can walk there in half an hour and cycle there in less than 10 minutes. A good place to start is VisitCopenhagen and AOK, Everything About Copenhagen. Vallensbæk Station is approx. 15 minutes’ walk from the harbor with S-trains departing every 10 minutes (in the daytime) for central Copenhagen. The ride to the central station is 27 minutes. To Nørreport, which is the station closest to Strøget and most attractions, the journey takes 30 minutes. It is free to bring bikes on the train. See travel times on Rejseplanen (Journey Planner). PLEASE NOTE! When you return to Vallensbæk, it is important to take line A – not line E, which does not stop in Vallensbæk! S-train tickets can be purchased at the 7-Eleven at the station or at the ticket machine on the platform, where you can pay by credit card. It is also possible to buy a ticket with the app DOT mobile tickets.